The Grade ll listed 17th century barn at Mill Bank Farm, off Mill Lane, is currently unsafe and in urgent need of repair/conservation “to safeguard the future of the building”. It would certainly be sad to see such a barn go to rack and ruin. 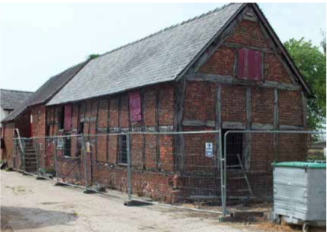 Cheshire East Council’s conservation officers have undertaken emergency repairs over the past two years and the 17th century barn is not currently in use as it is deemed unsafe. This entry was posted in Planning Applications, Village. Bookmark the permalink.